I’m imagining the book “To Be Men” has been written as a way to “take back” traditional maleness from the prevailing western cultural view. Does it need taking back? In my opinion, yes and here’s why. There’s been a lot of talk about inequity along a variety of scales, be it gender, race, orientation, and what have you. I subscribe to a number of news and social media sources so I can consume as wide a range of opinions and viewpoints as possible. I’m not interested in just listening to my own voice. What I’ve discovered is that efforts to promote equality and equal access aren’t producing that result. What seems to be happening is that the bias is merely being shifted rather than eliminated. In the current context, instead of opening up the world of speculative fiction to more than just (supposedly) white males, and to stories about more than just (supposedly) white male heroes, the emphasis has realigned toward acceptance of all other people as authors and characters except white males. I don’t know how pervasive this is lacking first hand experience, but in seeking publications to which I can submit some of my short stories, I’ve noticed that many of these venues specifically request tales only from “marginalized populations” at the exclusion of anyone else (i.e. white males). I can imagine that this is seen as a way to balance the scales and thus to promote equality, but the actual effect is simply to shift the balance from one side to the other, not eliminating inequity and enmity between different groups of people, but instead exacerbating it. To me, inclusion is giving everybody equal access to the opportunity to submit stories and have them accepted for publication, including the aforementioned white males and everybody else. Granted, publications can be themed. Not every magazine publishes every genre, so you’re unlikely to find a pure teen romance story in a science fiction and fantasy periodical. So it makes sense that you’d have anthologies that would be focused on “strong female characters,” the LGBTQ community, people of color, and so on. Which brings us back to “To Be Men.” If you can have those other specialized periodicals and anthologies catering to specific groups, you can have one by and for traditional males (and it’s amazing how many women still seem to like and want to associate to traditional males – especially when there’s a spider to kill or a carpentry project to be performed around the house – that last bit is a joke). 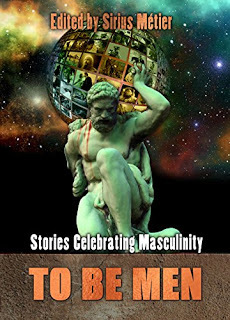 I think an anthology like “To Be Men” is necessary to balance the scales in speculative fiction. Such a book doesn’t have to be interpreted as “anti-female” or “anti-feminist” anymore than a publication spotlighting feminist authors and themes necessarily has to be “anti-male” or “anti-masculinity” (although I can see how that perspective can occur from both sides of the fence). Of course, there’s the argument that masculine heroes already exist in abundance and have since time immemorial. Let’s take superhero comic books and films as an example. Traditionally, comic book superheroes have focused on the male hero or a group of male heroes with a single female member who is never the most powerful. In the silver age DC comics, there’s something called “The Trinity” or the most popular trio of heroes. It’s Superman, Batman, and Wonder Woman. The original Justice League of America was an all male team except for Wonder Woman. My favorite silver age Marvel comics are The Fantastic Four, Spider-Man, The X-Men, and the Avengers. All of those groups I’ve mentioned had all male members except for one woman. Over time in comic books, that’s changed somewhat to reflect the larger social bias, but the superhero movies for the most part have not. So far, the only single superhero movie to be headed by a woman is “Wonder Woman” (2017) starring Israeli actress Gal Gadot. If you’re looking to balance the scales in the cinema, then you have a long way to go. However, the film industry seems to be lagging behind the publishing industry, whether speculative fiction or comic books, which are bending over backward to be inclusive. That’s not a bad thing as far as it goes, but again, where’s the balance? The whole world isn’t filled with progressive good guys (good people) and conservative, white, male villains. Real life doesn’t work that way, but you can make fiction say anything you want. Twice in the same movie, Ras al Ghul (Liam Neeson) compared balance to justice. If you want equality and you believe it is an expression of justice, then ignoring balance or even deliberately creating imbalance is only promoting inequality in a different direction. So by all means, create speculative fiction that celebrates women, LGBTQ heroes, heroic people of color, heroic Muslims, but at the same time, make room for heroic men, heroic Christians, Jews, and Hindus as well as Muslims. Try speaking to the widest possible audience so that more people can relate to your stories. The more the entertainment industry (and I’m thinking especially television right now), tightens its focus and only allows a certain and highly specific narrative to be presented, the more people are going to disconnect from what they’re producing. There are TV shows I don’t watch anymore because they’ve become little more than mouths speaking only that narrative. In attempting to communicate the messages the creators believe are the most important, they are shutting the ears of the very people who they want to listen. In other words, they are only talking to themselves. Even though there’s nowhere for me to publish it, I might try my hand at a “male-oriented” story or two, just for giggles. And then one must determine “What is Man”. What are the gender characteristics that one believes to be typical; and does one select among statistically typical characteristics to emphasize a positive and uplifting potential, or does one allow negative degrading characteristics to dominate and discolor the image? Do we ask the Psalmist’s question: “What is Man that Thou art mindful of him? … Thou hast made him a little lower than the angels, and crowned him with glory and honor” (Ps.8:5-6 [4-5 in Christian bibles]). Actually, a modern translation of the Hebrew text would represent the question thus: “What is a person, that You will remember him? Or a [mere] human, that You will take account of him? You have made him [only] a little less than G-d, and with honor and majesty will You crown him.”. That sort of view presents a tall order and a challenge to rise to the occasion, as well as a hope that it could be possible to achieve — to either a man or a woman. The other sort of view is merely discouraging, so there is much to commend a selection of typical characteristics for either a man or a woman that challenges either to become the best they can be. What, then, will this anthology deem to be representative of masculinity? Ancient Greeks and Romans, among others, had a different view of it than did the Israelites, pursuant to different expectations of the purposes that men should pursue or accomplish. One’s worldview is entirely determinative in such matters. I can only imagine that the authors who have their stories published in this anthology are speaking to what we would consider the traditional American “gentleman” and perhaps the stereotypic “square-jawed” hero, but I’d have to read those stories to really know for sure. So when the Psalmist asks “what is man?” meaning “what is human?” it’s not the same topic really as what we may find in the “To Be Men” book. It’s addressing cultural issues rather than the nature of humanity and our relationship with God. Interestingly enough though, a number of people involved with Superversive Press are Christians and specifically Catholic, so approaching the question from a Biblical point of view would indeed be interesting. What is it to be male in relationship to both larger humanity and God? And yes, “To Serve Man” is a science fiction classic.